One of the greatest beauties of travel is the escape from everyday life, breaking the norm. And the best kind brings total relaxation to mind, body and soul. Find such nirvana at JW Marriot Resort and Spa in San Antonio, Tex. The JW Marriott San Antonio Hill Country Resort & Spa caters to all ages, offering an enjoyable experience to the young and mature. The palatial resort sits in the Cibolo Canyons, where oak and cedar trees frame the area. The 26,000 square-foot Lantana Spa is a must for the perfect day of pampering. Choose from an array of massage services. Recommended are the restorative organic massage and the saving face facial- both JW Marriott Signature treatments. The restorative organic massage is a “hypnotic restoration ritual by Naturopathica which begins with a citrus inhalation and vigorous scalp massage to restore mental clarity and is followed by a steaming hot towel massage and foot treatment.” The saving face facial offers a gentle enzyme peel and a healing mask. In addition, a bonus relaxing upper body massage and nourishing hand treatment are part of the treatment. After a therapeutic hand massage, each hand is moisturized and covered in plastic to help absorb the nutrients. The signature facial and body mas-sage offer the perfect combination of total relaxation. There are 30 treatment rooms, two couples treatment suites in addition to two outdoor private treatment rooms. The Spa offers its own fitness center with cardio-training equipment, free weights, and stationary weight training equipment. The fitness studio offers exercise, yoga, and fitness classes. Set aside a leisurely day of total re-laxation, enjoying the salt water spa pool, the lavender room infused with the refreshing, herbal scent, the steam room or whirlpool. Delight in a gourmet meal at the Replenish Spa Bistro, exclusive to spa guests.And for every golfer’s dream, enjoy the latest addition to the PGA TOUR’s TPC Network of premier clubs. Thirty-six holes of golf have been skillfully designed by Pete Dye and Greg Nor-man. The course offers an immaculate landscape design, situated within the 2,800 lush green acres of the Cibolo Canyons development. The courses are accessible only to Club Members and guests of the JW Marriott San Antonio Hill Country Resort and Spa. The River Bluff Water Experience will indulge visitors with its six acres of pools, fountains, waterfalls, rivers, and poolside lounges. Take a relaxing lap around the 1200 foot Lazy River while absorbing the rays. Thrill seekers will be satisfied by the two 275 foot long Acequia Tube Slides. Take a high speed glide down the winding tubes.The Pedernales River water slide is described as offering lower gradients and higher volumes of water, similar to a natural river. The hydraulic mechanism gives visitors a fast ride down the winding slide. The Children’s Pool area offers its little visitors a zero depth beach entry pool with two kiddie slides. It is a H2O dream playground. And speaking of children’s water fun, the Range Riders Boys and Girls Club is a full-service children’s recreation program offered for guests, ages 4 to 12. Various arts, crafts, games and activities will keep the young rangers entertained. Choose from snake painting, cowboy hat decorating, t-shirt painting, jewelry making or rock painting. And only in Texas will a resort offer young, adventurous spirits the chance to lasso a longhorn. There are plenty of tantalizing dining options to choose from. Cibolo Moon offers a relaxed and luxurious atmosphere with flavors from the Southwest and Mexico. Find tequila shrimp, bacon wrapped jalapenos and bison meatloaf. Two entrees can be sampled for $19.00. There is also the house specialty which is chicken fried steak in a pepper milk gravy. Sports enthusiasts will enjoy the High Velocity Sports Bar along with a plate of bbq nachos, brisket or ribs. 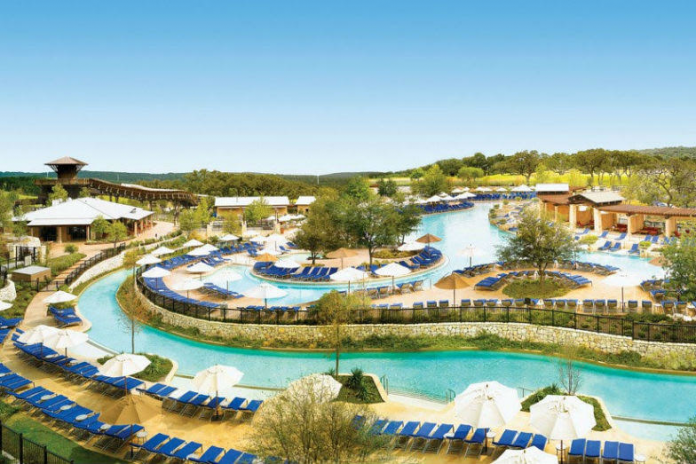 The JW Marriott San Antonio Hill Country Resort & Spa is the perfect one stop destination for relaxation and rest. Take advantage of the $125 activity credit special. Reserve a two-night stay and receive a $125 credit toward the golf and spa. For more information on the luxurious Resort and on other current promotions, visit www.jwsanantonio.com or call 1-866-882-4420.